Hot on the heels of Apple’s official response to the iPhone 6 family bending controversy, Consumer Reports performed its own bending test on the duo of devices. In order to make things more interesting iPhone 5, LG G3, HTC One (M8), and Samsung Galaxy Note 3 joined Cupertino’s finest. Consumer Reports put the devices through a “three-point flexural test.” The latter is similar to Apple’s own three-point bend test that we told you about yesterday. The test revealed that the iPhone 6 and the iPhone 6 Plus are actually able to take more abuse than the 55lbs (25kg) of pressure Apple subjected them to. Apple iPhone 6 Plus needed 90lbs (about 40kg) to deform, while the 4.7” iPhone 6 needed 70lbs (about 32kg). As it turns out, iPhone 6 Plus needed more pressure to bend than its smaller sibling. However, both the iPhone 6 and 6 Plus came nowhere near the 130lbs (about 59kg) it took to deform an iPhone 5. 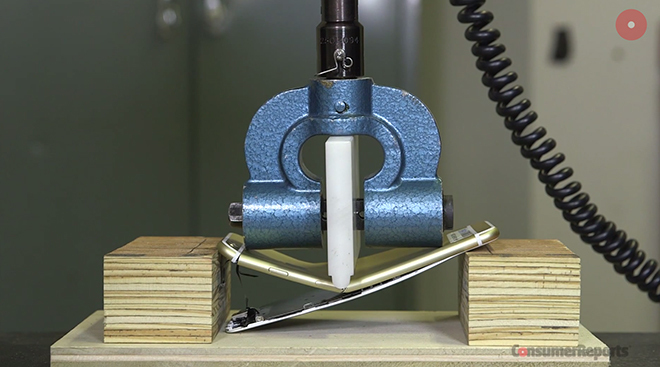 Samsung Galaxy Note 3 came on top of this test with 150lbs (about 68kg) necessary to bend it. The Korean phablet is simply built like a tank. 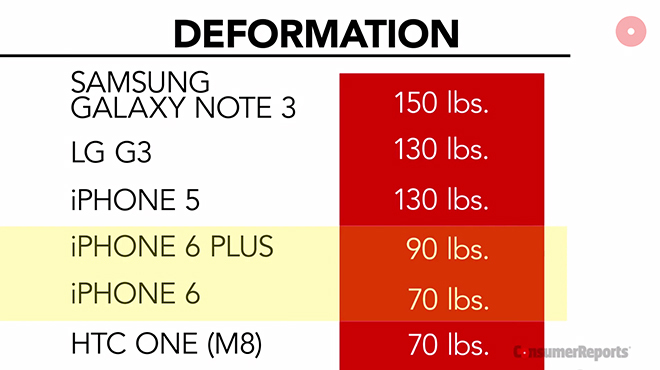 LG G3 and HTC One (M8) needed 130lbs (about 59kg) and 70lbs (about 32kg) to deform. In short, plastic devices came on top of the test by Consumer Reports. The next step in the test was to find out the necessary amount of pressure to separate the display of the device from the chassis. Apple iPhone 6 and iPhone 6 Plus took 100lbs (about 45kg) and 110lbs (about 50kg) respectively to completely break. The iPhone 5 on the other hand, needed 150lbs (about 68kg) to give up – as much as the Samsung Galaxy Note 3. You can check out the video from the test by Consumer Reports below. On a separate occasion, the source of the original iPhone 6 Plus bending video, Unbox Therapy, posted another clip where an Apple phablet met its fate. The clip compares the iPhone 6 Plus rigidity to that of the new Moto X. See it below. What do you think of the latest videos? Did you see enough footage of smartphones being destroyed over the past few days? I surely did!